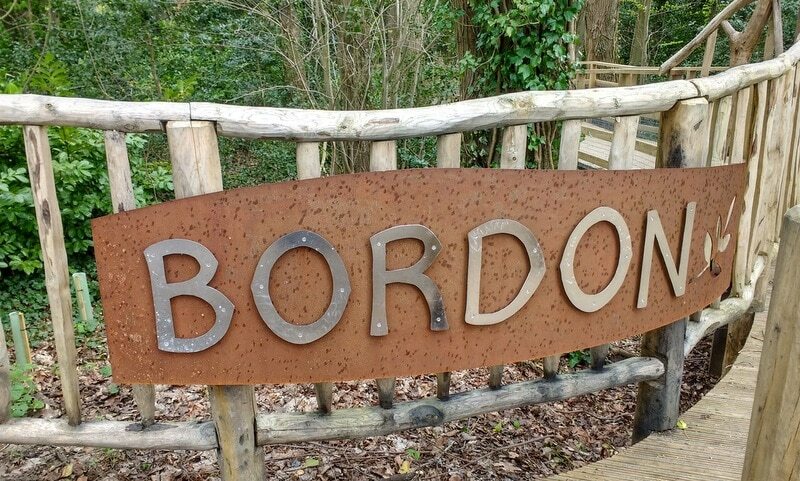 This was an exciting and pioneering project to create a new community woodland area, a Suitable Alternative Natural Greenspace (SANG) in the middle of the new residential zone in order to attract local dog walkers away from the more sensitive SSSIs such as Broxhead common. 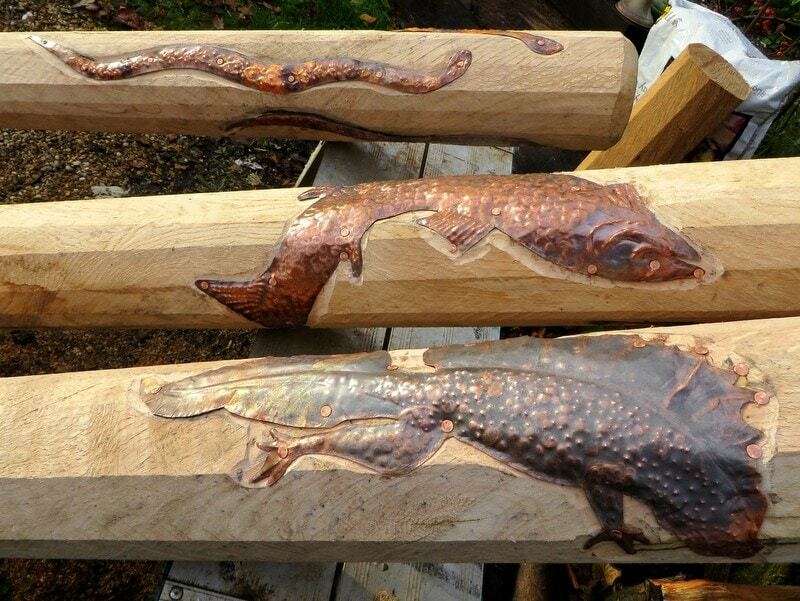 My brief was to create artistic features that sustained the interest of residents who might use the wood on a daily basis and to work with a landscape group to integrate the designs into a network of pathways and open spaces throughout a diverse 24 acres of mixed woodland that borders the River Wey. 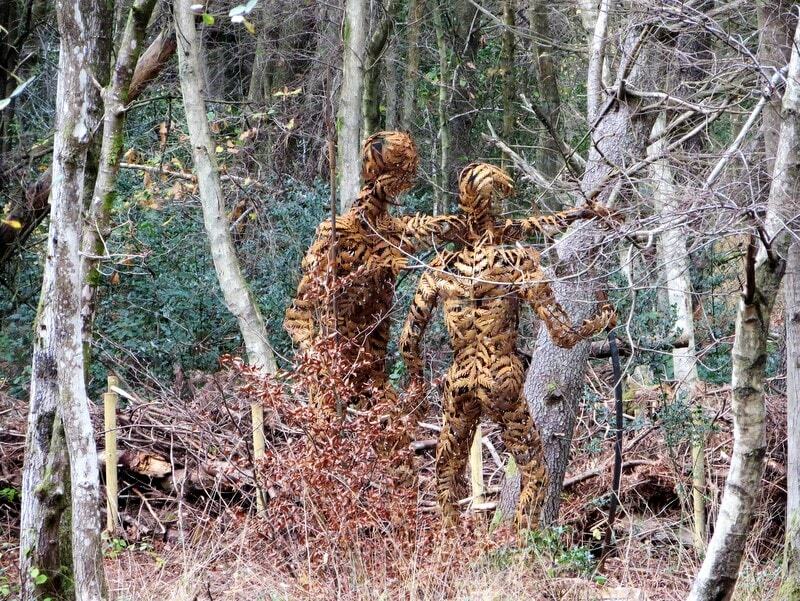 These are two hunters pointing at their quarry of a deer through the trees. 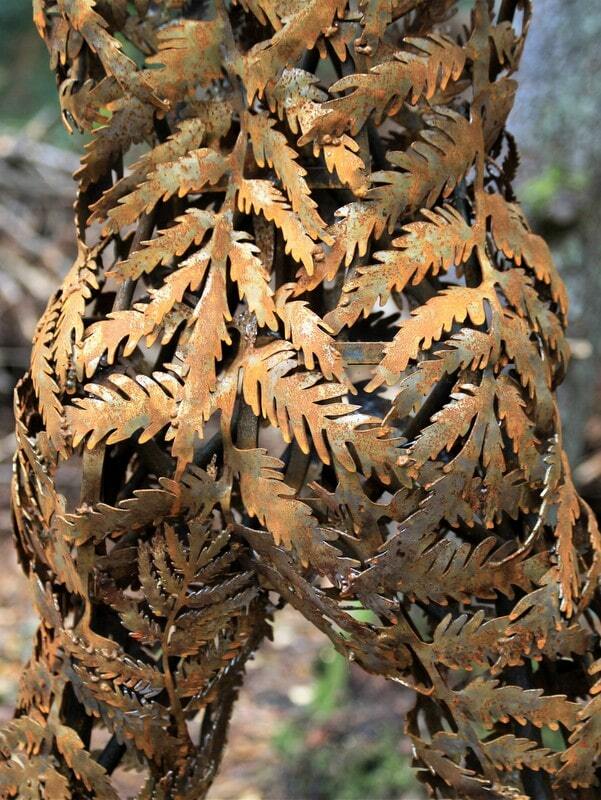 They are constructed on steel armatures and covered in beaten steel laser-cut fern leaves. 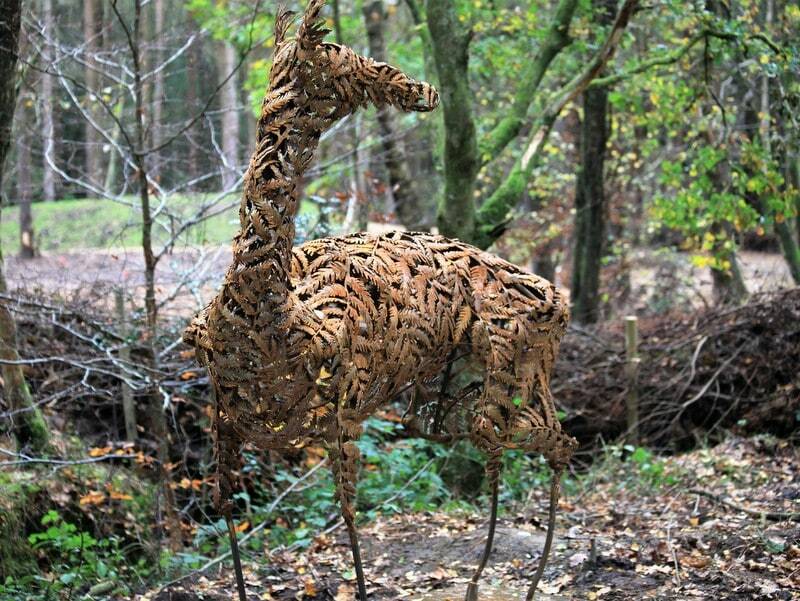 These have been left to rust until they are the colour of bracken and then treated with Owatrol to give them a lustre. 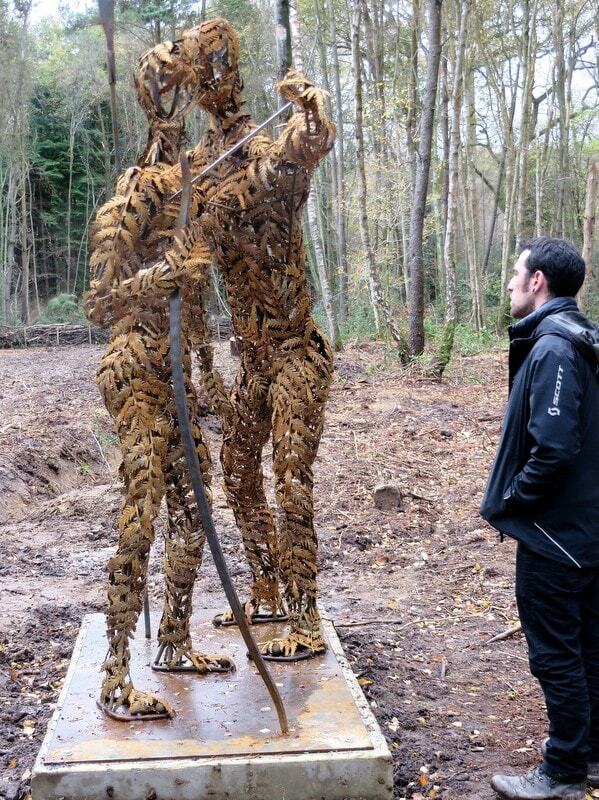 This was a major undertaking and I am hugely grateful to Richard Weaver for the crash course in metal-work and enormous generosity of his time and resources that made this sculpture possible. I had such a lot of fun making these pieces! 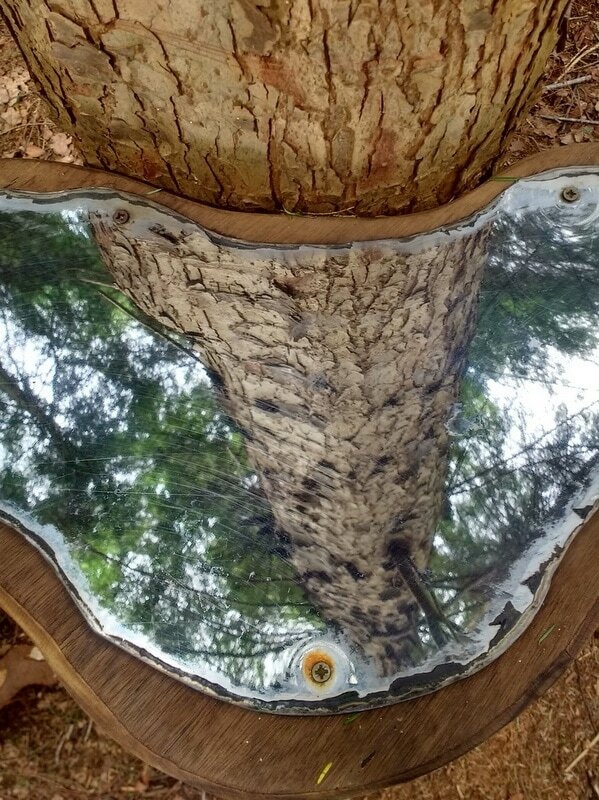 This is a piece that celebrates and enjoys the major natural feature of this curious woodland, the King Oak right in its heart. 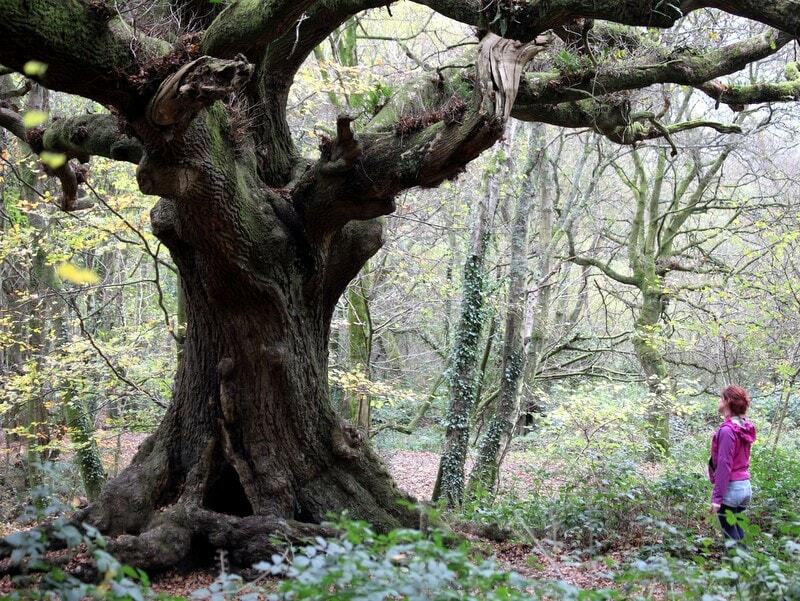 It is 450 years old and in every way a magical tree and much loved by local people. 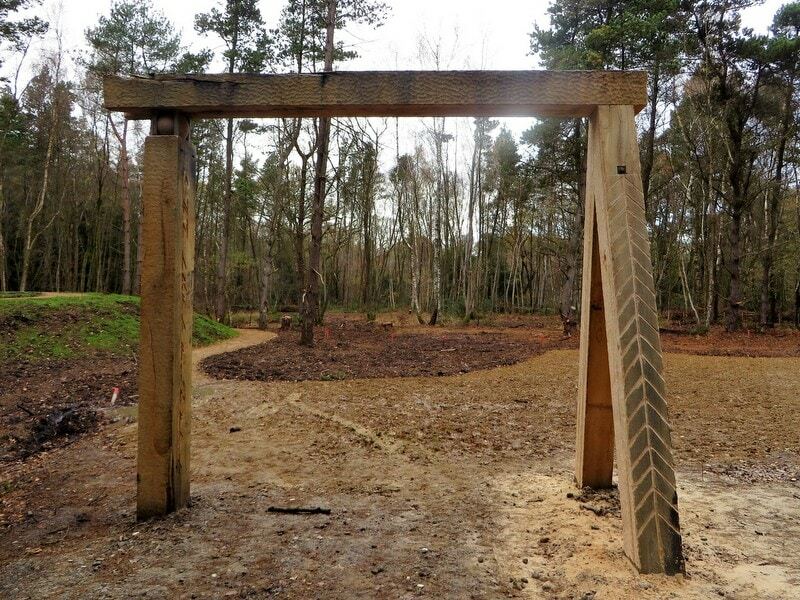 The seat is positioned so that they can comfortably appreciate the Oak from just beneath the nearby yew trees. This has been a popular feature so far. 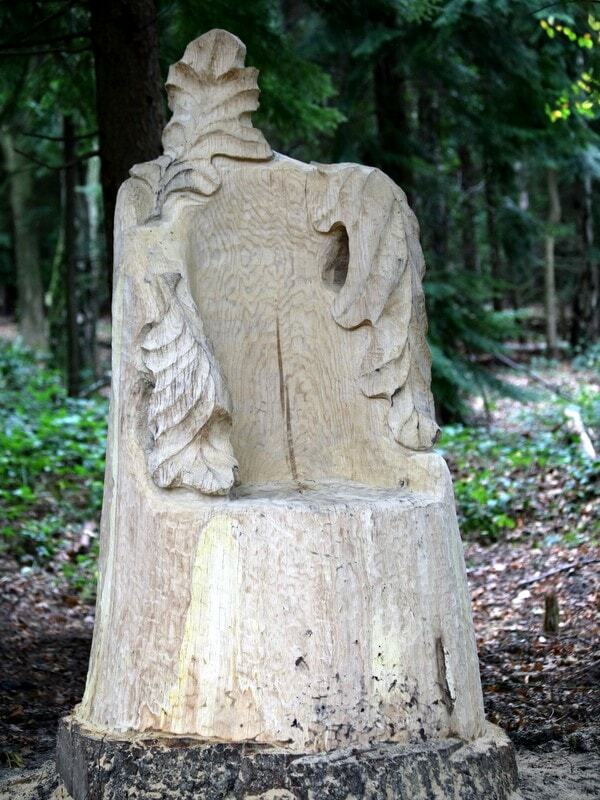 It was made by Phil Walker, local tree- surgeon and sculptor and Joel Andreus, also a tree-man and carver. This was another huge mission, mainly because oak with the dimensions needed turned out to be very difficult to find. After nearly giving up looking, there was a storm that blew down two oaks on the farm behind the house and one of them provided the timber for these long lengths. 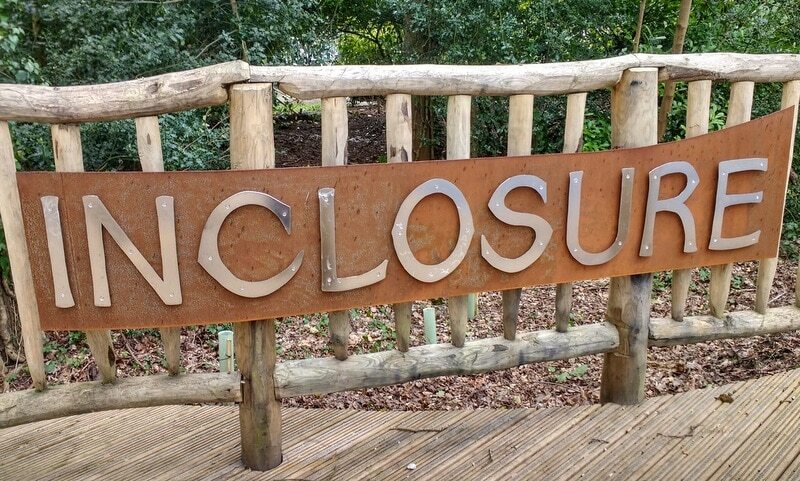 I worked them with my new Holey Galahad tungsten tipped ‘doughnut’ and added runes that say “The Crack of Dawn”, a not so private joke between “Irish” and me, but this can be decoded by visitors when the 9 foot table with the key on it is installed nearby. 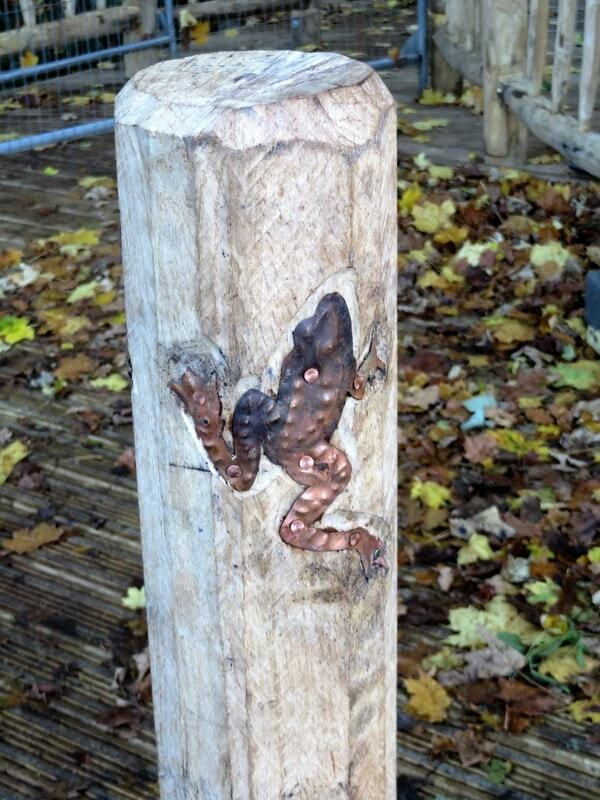 The surface is stained with ochre and lime and the top joint holds in place a stone ball. 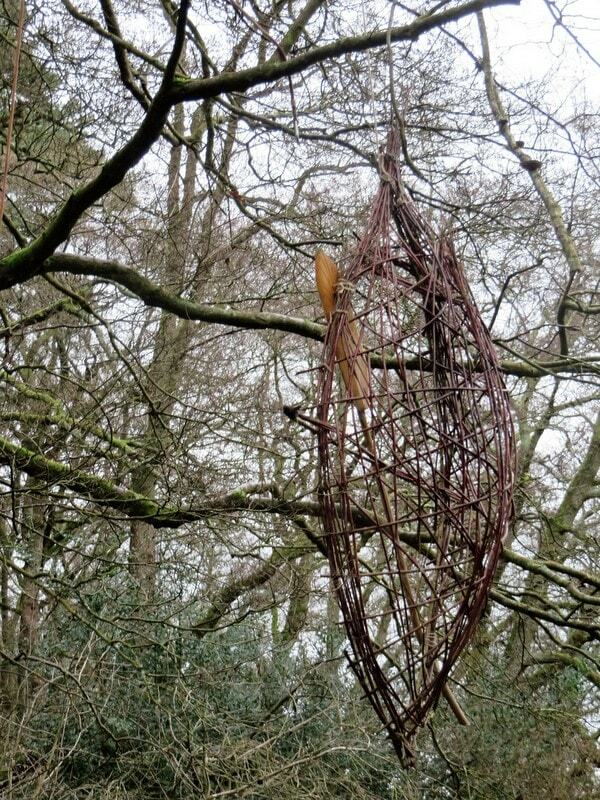 This was the first piece I completed and was inspired by the enthusiasm of Paul, our chief landscape architect, who kept urging us to look up at the tree canopy to admire the larch tops in winter. 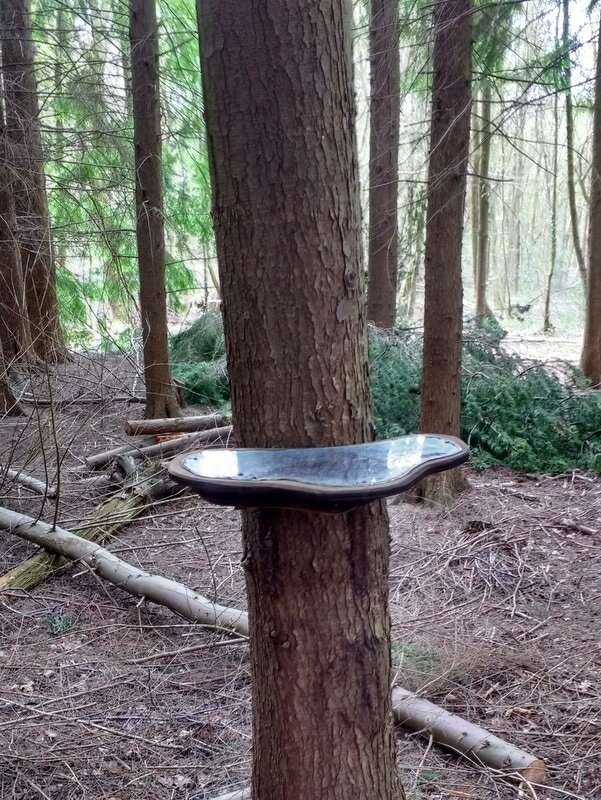 They are constructed with mirror steel onto creosoted ply layers and inspired by the many examples of bracket fungus on the trees in this wood. 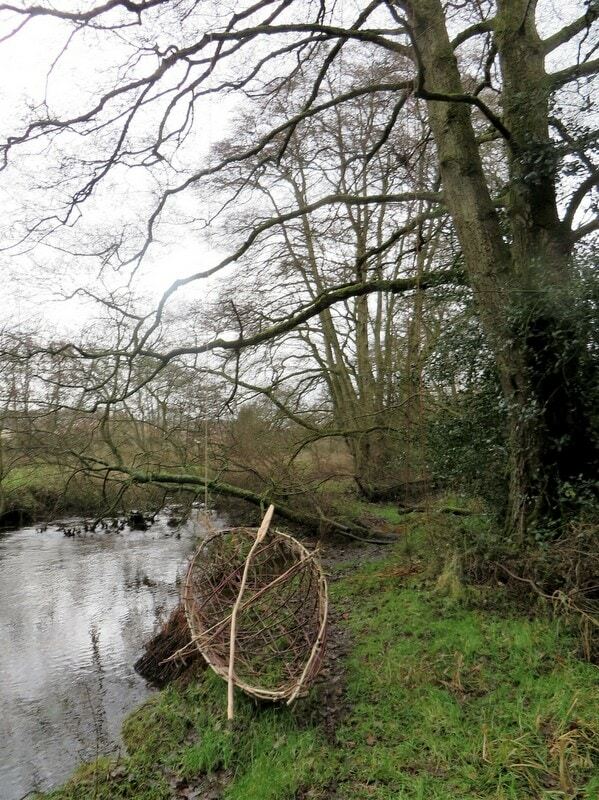 In the bend of the river is a perfect spot to quietly contemplate the meandering flow. 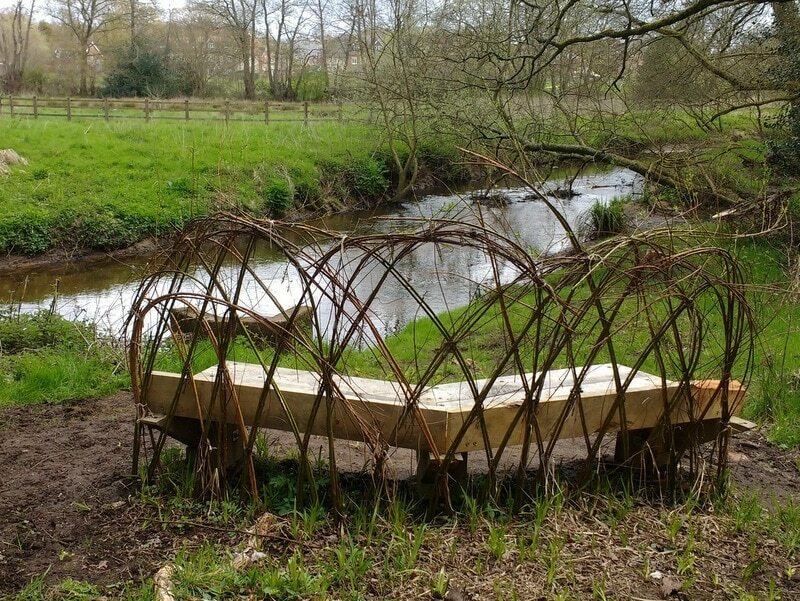 An angled bench backed by a willow screen provides two-way privacy and suspended over the water in the alders are two willow coracle frames. These are the only two deliberately ephemeral features and are meant to gently disintegrate in time. © 2017 Madeleine Allison. All rights reserved.